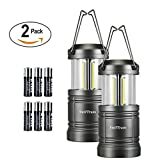 We have these camping lanterns and think they’re fantastic! Grab a 2 pack (at a much better deal than we paid) in the next few hours for just $10.99! Regular price on these is $59.99! These make a perfect addition to your camping bag, they cast a bright crisp light and slide up and down to adjust brightness.